At 8AM the temperature was 65.3F with a partly cloudy sky. By 10:15AM I had the awnings washed and they turned out really good. The cleaner I used came from Apache Junction RV. It worked so well I doubt the “Tree Huggers” back home in Nova Scotia would let them sell it. The temperature at 10:15AM was 76.1F and it felt like 76F according to the weather station. They are good. They can notice a 0.1F degree difference. This was under a partly cloudy sky. Joan and I left shortly after 11AM and tried to locate a couple of camera shops to see if we could salvage the photographs inadvertently erased. These places are so poorly marked around here it drives one up the wall trying to find one. The only one we found was so poorly run down we simply carried on. We came to Wal-Mart, Apache Junction, and went in there. For $14.00 we purchased a new card for the camera. We will see what we can do when we get back to Nova Scotia. We picked up a few things at Wal-Mart and went on to Fry's. Joan went into the grocery section and I went for diesel. The truck was just below half full so $50.00 should fill it. I purchased the fifty through the glass cage and went out and filled the truck. She came to the three quarter tank mark only. It looks like the fuel bill going home is going to be a bit higher than coming down. I was going to get a hair cut but decided that will give me something to do tomorrow morning. We do not want to do it all in one day. We had lunch at the Subway Sandwich Shop with George the former tail gunner in the 8th Air Force. We have found him three times and he is very interesting to chat with. He is going home to Michigan on May 12th so we hope to see him again. He is camped in another RV Park in the area. The temperature when we arrived home at 2:15PM was 85.5F, that felt like 82F with scattered clouds. The cloud was high cirrus and a bit of alto cumulus. The truck thermometer was hanging right around 82F. A nice warm day just right for sitting out and watching a few weeds grow up through the gravel. 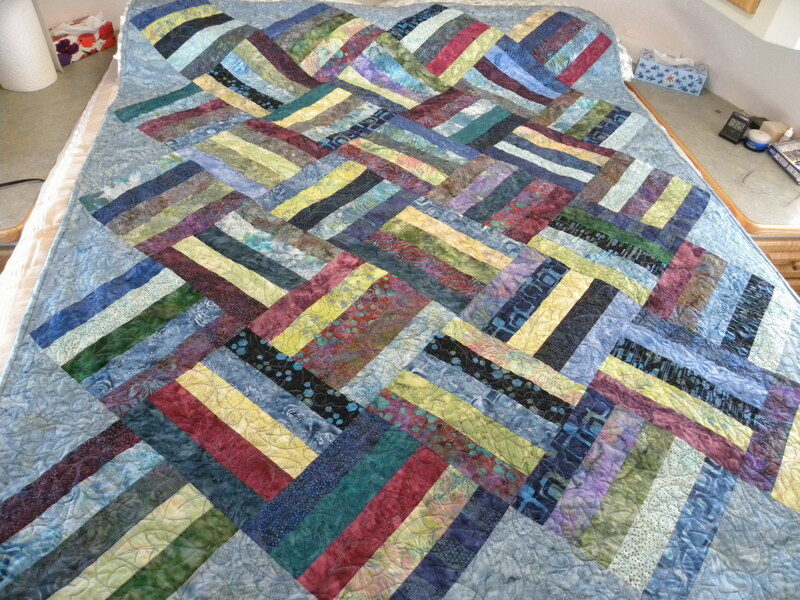 Quilt number two. Joan spent the day hand sewing her quilt when not out and about. 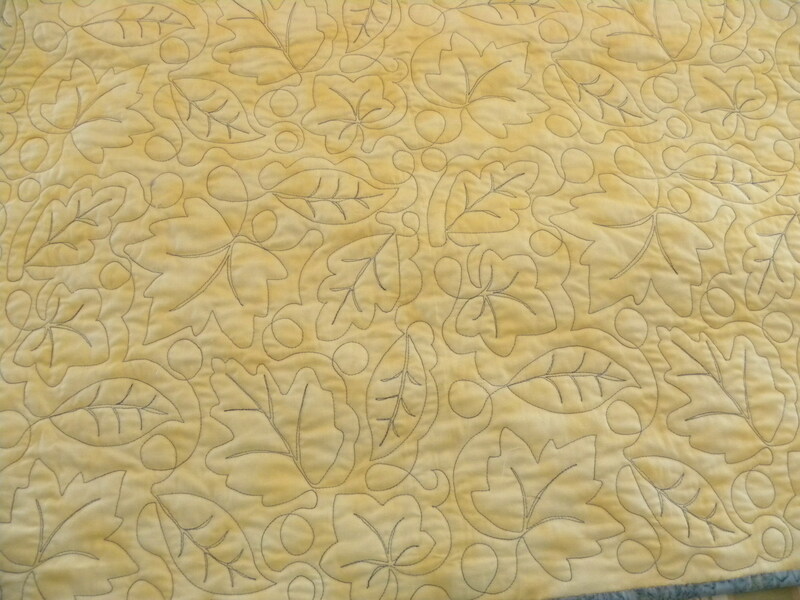 She finished the quilt at 3:15PM. 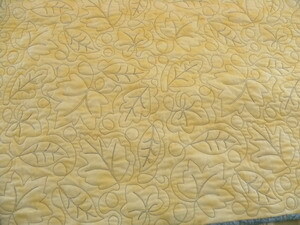 The quilt is quilted in New England Autumn Leaves. The maple leaf is the easiest to note then one can pick out the others. It is one beautiful job. We were over to Ron and Jan's for supper. Ron did the steaks and they were perfect. After the excellent supper Joan and I did a dumpster trip and checked the mail. We arrived back at the trailer at 8:10PM when the temperature was 73.4F that felt like 76F under a clear sky. There were lots of stars and aircraft to watch on our walk. I could also see some cirrus cloud up there. The weather station did not see it so it is not official. The day ended when another movie ended. The temperature at the time was 66.1F that felt like 66.1F with a clear sky.